Well, I think the photo says most of what I need to say about this one. It’s really very luminous and the colors are great – both the red at the base and the green near the top. The upper termination is very rich in faces and the base is re-crystallized. This was in Steve Smale’s collection, so we will send you his label. 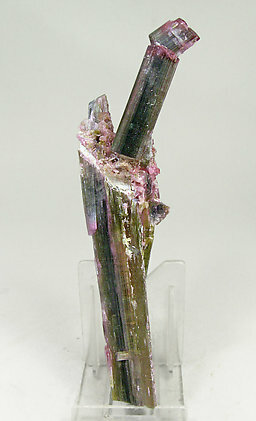 Black head Elbaite. Recrystallized at its base and good transparency and shape. Probably one of the best samples found at this new locality in India. 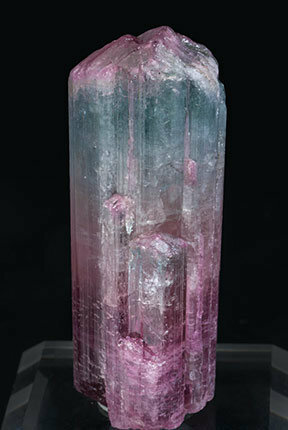 A floater parallel growth of prismatic doubly terminated crystals, transparent and of an excellent color and luster. 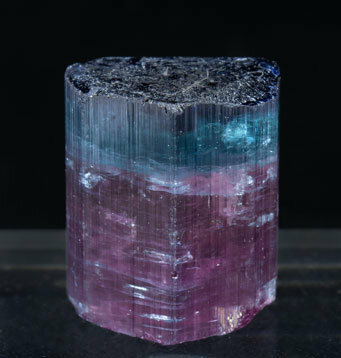 One of the terminations has the same color as the prism but the other is deep blue, easily visible under an intense light. An especially good sample from a new locality unknown up to now. The crystal is partially doubly terminated. One of its terminations has the bright and very well defined face of the pedion, meanwhile the faces of the opposite termination are clearly rhombohedral. The central zone of this termination is rough due to a contact. 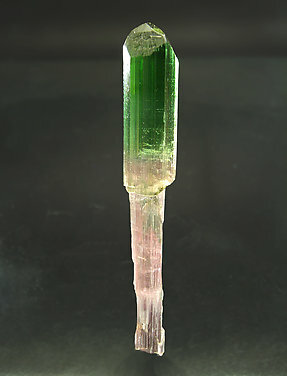 Floater crystal with a considerable length, doubly terminated, with parallel growths in one termination, transparent and showing very well defined color zoning with dominant green, pink and yellowish areas. Near one of the ends there is a small Quartz crystal. 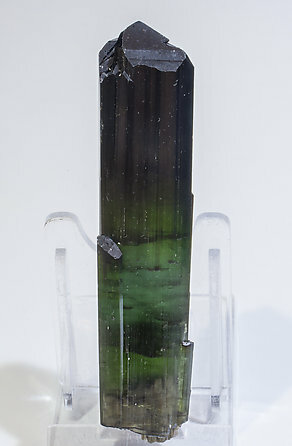 Doubly terminated Elbaite crystal, with different terminations. One of them with a single pinacoidal face and the other a little bit more complex with the pinacoid and six uneven faces from a pair of trigonal pyramids. 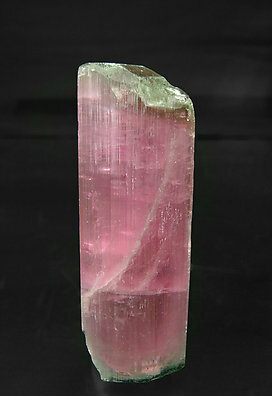 Translucent and excellent and intense pink color with greenish tones at both terminations. 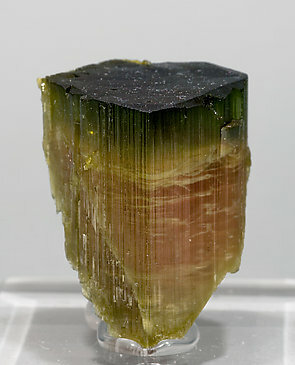 A curious prismatic crystal on matrix. It has a slight bend made when it was growing. The zone of torsion coincides with the change of color from green to red. The crystal is doubly terminated but one of the terminations, pinacoidal, is smooth while the other one is not so clear. A single crystal with very well defined terminal faces consisting of a dominant pinacoid and a rhombohedron. It is transparent, with an intense red color at the base and a blue termination, popularly known as a blue cap. It is different from what is usually found at this mine. 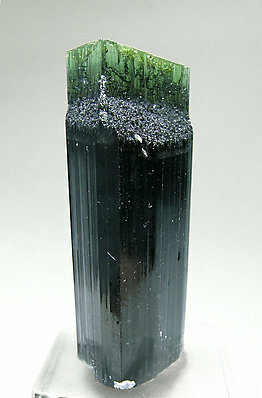 Single crystal with very well defined parallel growth and terminal faces. It is transparent and has colored zones alternating between pink and bluish green. It is different from what is usually found at this mine. 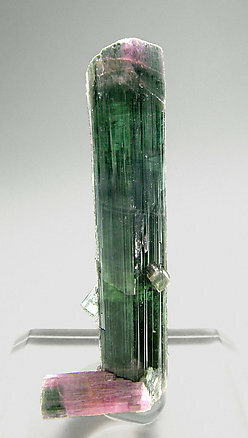 Single crystal with very well defined parallel growths and very well defined terminal faces. 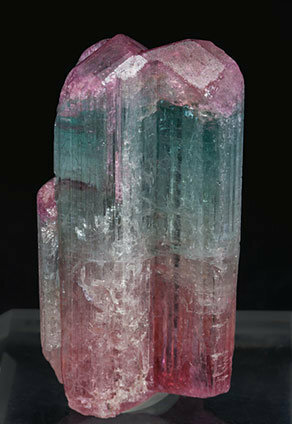 It is transparent, with different color zones alternating between pink and bluish green. It is different from what is usually found at this mine. 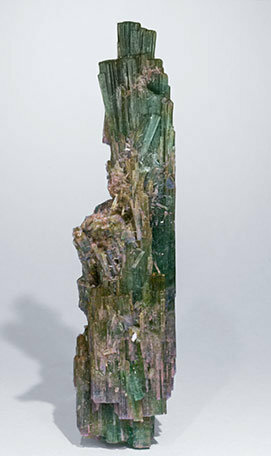 Single crystal with a very well defined parallel growth and very well defined terminal faces. It is transparent and has colored stripes alternating pink and bluish green color. It’s different to the most usually found at this mine. 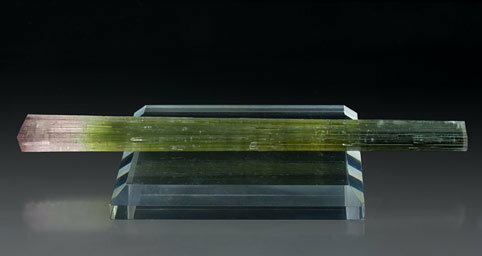 Single gemmy crystal, fully transparent and very bright, with very well defined faces and edges on the prism and also on the terminal rhombohedra. A crystal of excellent quality. It is different from what is usually found at this mine. A crystal with two very different terminations, one of them with excellent terminal pyramidal faces and the other has a hoppered acicular polycrystalline growth and small Feldspar crystals. 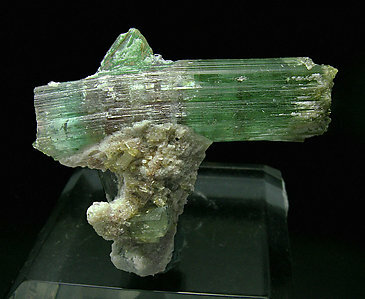 It is transparent and bright and with a very intense green color. 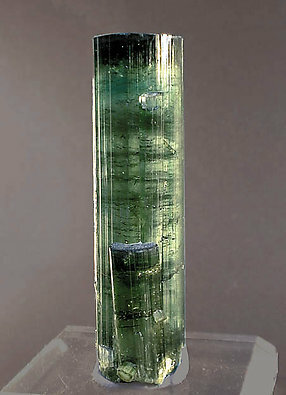 Doubly terminated crystal with very well defined parallel growths and clearly hemihedral forms, with one of its terminations flat and bright and the opposite pyramidal and polycrystalline. It is very bright, translucent and has an intense green color with pink areas. 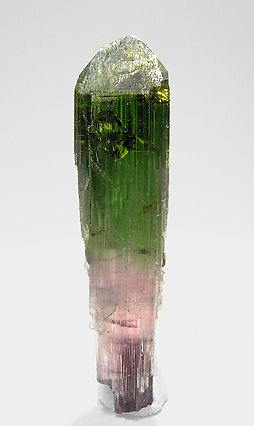 An elongated crystal, deep green colored, very transparent, bright, with all its faces perfectly preserved and growing on a thin pink prism, probably the product of the loss of the green portion once covering the pink stem. A very nice oddity. 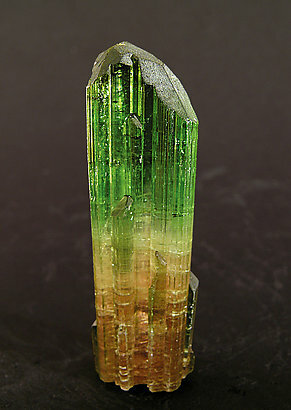 A bicolor crystal, typical of the locality, with excellent definition of its faces and a perfect, very sharp termination very rich in faces on the upper end, and more fibrous on the lower. 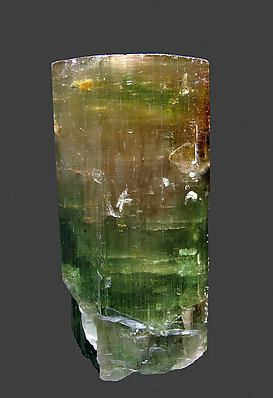 A doubly terminated Elbaite crystal with multiple striations parallel to the main axis, and dissolution forms. One of the terminations is not evident but the opposite is multiple and has been modified by dissolution structures. Good transparency and we would like to emphasize the slight color gradation between reddish tones to greenish blue along the crystal. A novelty from the Munich Show 2008. 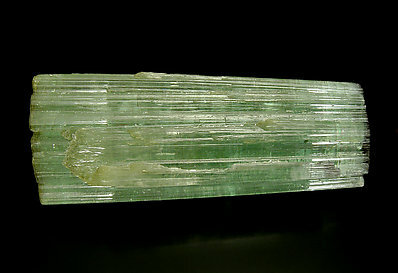 Out of the velvety terminations of these remarkable Elbaite crystals rise three transparent light green "walls," very much resembling the Mercedes emblem when you look down the length of the crystal. 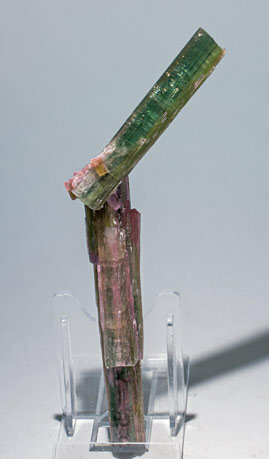 The trigonal symmetry of Tourmaline is evident in this rare display of crystal capriciousness. This specimen was photographed for the ‘what’s new at Munich 2008’ section of the magazine ‘Mineralien Welt’ and appears on page 13 of number 1/2009. The crystal has a recrystallized termination while the other is complete. 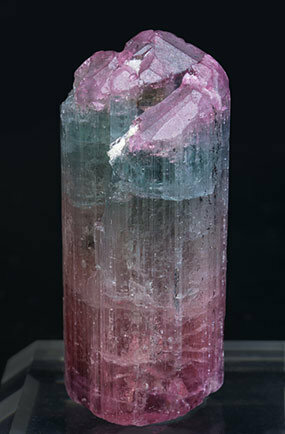 It has uniform green color, a good transparency and it is partially coated by small crystals of the variety Rubellite. 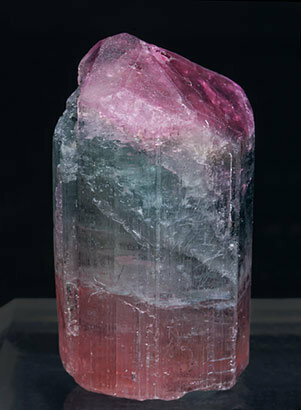 A curious growth in which the crystals, with a marked zonation of color, start successively one after one. 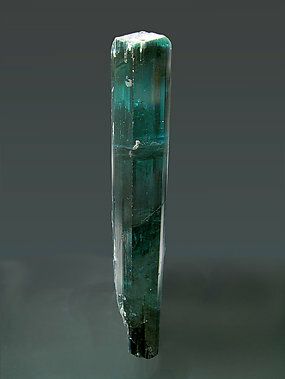 The two most well-defined crystals are perfectly doubly terminated and show two different terminations, one with a flat pedion and the other with a pyramid. It is not repaired or reinforced and appears as Nature and the pegmatites made it. 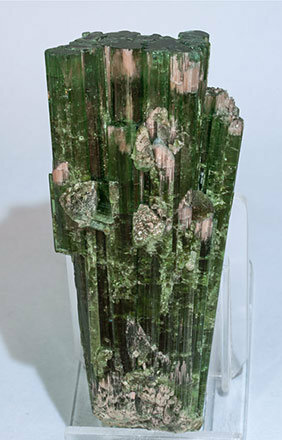 Very aerial and esthetic aggregate of elongated crystals with defined terminations, translucent, bright and with a dominant green color and areas with pink shades. Floater and complete crystal that has an excellent flat termination, with small faces of the rhombohedron and, on the opposite end, a polycrystalline growth with acute rhombohedral terminations. 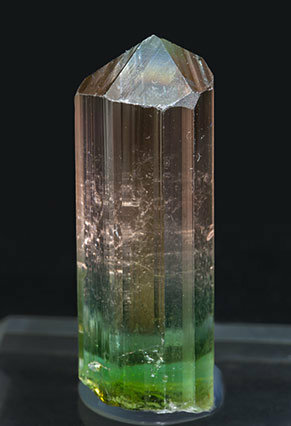 The color zoning, typical for the locality, is very well marked, with a green cap and pinkish-red shades in the body of the crystal.